Like an endless loop of schadenfreude, Warner Bros has released a supercut of most of Tom Cruise’s deaths in Edge Of Tomorrow. The film is hitting home video soon, which is a good chance for people to catch this little seen would-be blockbuster that A.V. Club’s own Ignatiy Vishnevetsky called an “entertaining, effects-driven black comedy.” For the many that didn’t see the film, the video could be considered something of a spoiler if the central premise wasn’t already plastered all over the marketing or even in its new title of Live. Die. Repeat. (or Live Die Repeat: Edge of Tomorrow). Cruise’s character, Cage, is caught in a time loop where every time he dies, he wakes up and repeats the day again (or, as it was usually described by most, Groundhog Day with mech suits and explosions). As Cage is in the midst of a war and honing his fighting skills with each iteration, this provides many opportunities for grisly ends to the Hollywood megastar. 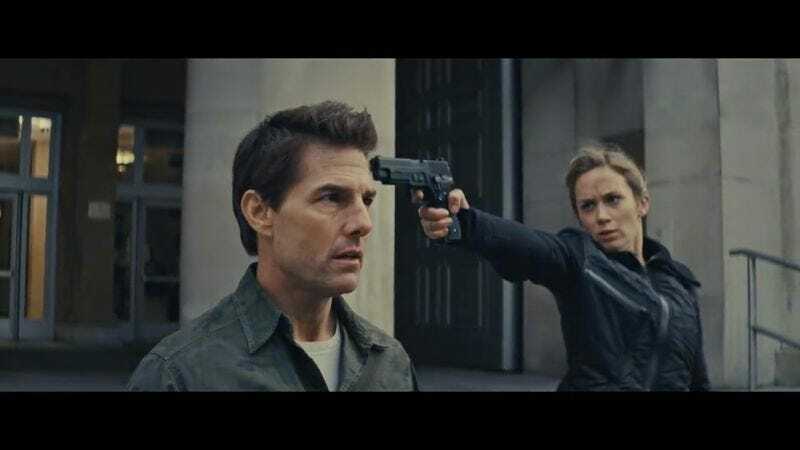 The supercut is a gift for both fans of Cruise, who get to see their beloved actor reveal more vulnerability than usual while stretching his comic skills, as well as his detractors, who get to relish in a minute-and-a-half of wholesale Tom Cruise slaughter.